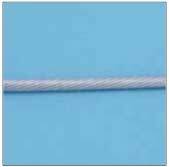 This stainless wire rope is made with 19 individual wires to make up a single strand . It's reasonably light-weight and a good fit for general rigging uses. The wire is oil free, polished and supplied on wooden or plastic spools. Other sizes and types available to 3" diameter on special order only. Please call for availability. As always, the (316 Stainless) is a good match for saline and wet environs.